Yesterday, I set up today’s post early and guess what? I posted it yesterday. Because fried from a weekend at Imaginarium. So today, I’m rerunning a column posted on this day in World Wide Recipes, “The Official Recipezine of the Internet.” I used to be the Culinary Chronicles writer (for a few years), but blah blah blah whatever so I’m not. Things change. Life happens. I still subscribe, and I highly recommend the email lists. Kudzu or Kuzu (or, in America, The Vine That Ate The South) has been used and valued in China and Japan for centuries as medicine, as food, and as landscape enhancement. At the Centennial Exposition in Philadelphia, Pennsylvania in 1876, the Japanese exhibit was a garden which included the strikingly handsome and sweet-smelling kudzu vine. Kudzu became popular in the USA as an ornamental plant, for soil erosion control, and as animal forage. By the 1950s, kudzu grew wild — really wild — throughout the southern states. At the rate of nearly a foot a day, it overgrows everything that doesn’t run. But Americans are finally recognizing kudzu’s medicinal and food value; Kudzu blossom jelly, syrup, kudzu quiche, stewed roots, pickled flowers, tea, quiche, ground kudzu root, casseroles, thickening for sauces or apple pie, boiled like turnip greens or spinach, and deep fried kudzu leaves are some of the kudzu’s culinary uses, not counting the meat and milk from animals grazed on the plant. Now, I’ve learned that, as this Smithsonian article documents, kudzu is not particularly invasive, but grows most vigorously where we can see it: along roadsides. Places that aren’t grazed and are sunny. It doesn’t like deep woods shade, and grazing animals will quickly kill it off. It’s natural Japanese predator has followed it across the ocean, too, so there’s that. Poor kudzu. 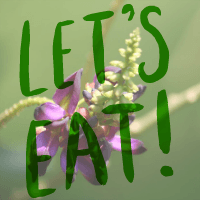 If you have some kudzu and want to eat it, here a link to Kudzu Cookbook. It’s very pretty. You’re welcome. Also, TODAY I’m posting at Fatal Foodies about a dish we were not so enthusiastic about: a cauliflower casserole. Apologies for posting today’s post and today’s link yesterday. What a maroon. A WRITING PROMPT FROM ME TO YOU: Write about a predator that becomes prey for what it thought it was going to eat. This entry was posted in Food. Tagged kudzu. What is kudzu’s natural predator? How did it follow? Was it deliberately introduced? So much I don’t know about kudzu. Never even seen it! I think the article called it the Kudzu beetle, but I don’t know what it’s etymological name is. It got here accidentally. Kudzu’s a pretty vine, but it grows all over everything it can, which isn’t good for other plants’ photosynthesis. Kudzu is The South, Amirite? I had seen it as a tea, but not all the other stuffs. I hear it has a sweet smell, so the tea would probably be delicious!